Hampshire sired pork leg roasted with rosemary, sage & thyme. 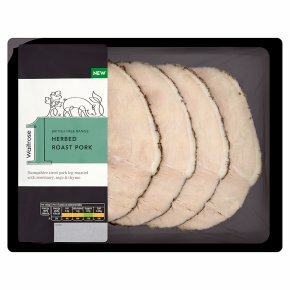 Sliced from whole legs of free range British pork, sired by Hampshire breed pigs, dressed with rosemary, sage and thyme then roasted. INGREDIENTS: Free range pork, salt, demerara sugar, rosemary, sage, thyme.